Executive Summary: Expertly crafted, expressive, individualistic, relatively conservative music by one of the better composers of our time. The Cello Concerto is a wonderful work. Performances are excellent. Highly recommended. Malcolm Forsyth was born in South Africa in 1936. By the 1960s he was a trombonist in the Capetown Symphony Orchestra while he was writing orchestrations for the South African Broadcasting Corporation. By 1974 he was a citizen of Canada and a member of the Edmonton Symphony. His music is an eclectic mix of elements of South African and North American folk music, a mix which produces a very personal style. His orchestral sense is, as one would expect with his background, superb. The early works of his that I have heard seemed somewhat labored at times. This would include works like the Piano Concerto of 1975. With works like "Atayoskewin" an orchestral suite dating from 1984, I felt the composer had found an ease to his expression. There is a simple, unaffected, honest expression to the music that at its best finds me more moved than by some music which may have more profound aspirations. This is clearly music of a Romantic aesthetic. Forsyth seems to be one of those composers who, without relying on the "technique de jour, "has found a personal style within familiar gestures and a conservative harmonic vocabulary. His Cello Concerto is a bit of a love story, for it was written for his daughter. 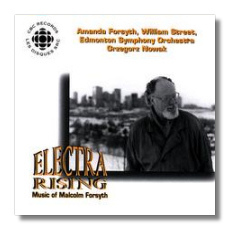 According to the program notes the composer suggests that his choice of title "Electra Rising," was an invocation of the Agamemnon/Electra, father/daughter relationship as a symbol of the close musical relationship between himself and his daughter. The first and third movements are long cadenzas of sustained beauty. This music is haunting, evocative and full of expression without being sentimental. This is not a work of the intensity to be found in a work like the Dutilleux Concerto. Forsyth's Concerto expresses itself directly in an uncomplicated voice, without being simplistic. His African background is clearly observable in the delightful second movement. It is marked with an imaginative use of percussion and is spiced by a judicious application of cross rhythms. The final movement is marked with all of the sweep that one would expect from a Romantic concerto. "Valley of a Thousand Hills" draws upon his African heritage. According to the program notes, each of the movements draws upon three distinct landscapes in South Africa. The suggestions of African music are quite subtle. It is a delightful essay, stylistically similar to his orchestra suite, "Atayoskewin," which found its inspiration in his adopted home of Canada. The Concerto for alto saxophone, "Tre Vie" looks, in part, to Italy, the location of its first performance, for its inspiration. The first, third and fourth movements are intended to represent three roads, the Appian Way, the Flaminiam Way, and the Salarian Way. Don't expect to another "Pines of Rome," for the music comes out as pure Forsyth. An added stylistic tendency in this work is the suggestion of some of the gestures of jazz, no doubt a result of the more common associations of the use of the saxophone. The program notes suggest a stylistic similarity to music of Walton, but I can't say that I heard much of that other than perhaps a shared rhythmic vitality. The second movement is titled "Ommaggio a Messiaen" in memory of the composer who died in May of 1992, when Forsyth was writing this concerto. It sounds a bit like an unmeasured cadenza with some appropriate suggestions of bird calls. The third movement is somewhat in the nature of a lament. The finale is rather reflective in tone and does not convey the bravura one generally associates with closing movements of a concerto. I found this concerto to be less engaging than the other works on the disc. It seemed as though he was writing a clarinet concerto and that character of the saxophone was not primary in his mind. All of the performances are excellent. It is obvious his daughter knows "her" concerto quite well for she plays it like it was a part of her spirit. The playing of the Edmonton Symphony under Grzegorz Nowak was clearly sympathetic to the spirit of the music. The recorded sound was excellent.